Peel the potatoues and cook in salted water until tender. 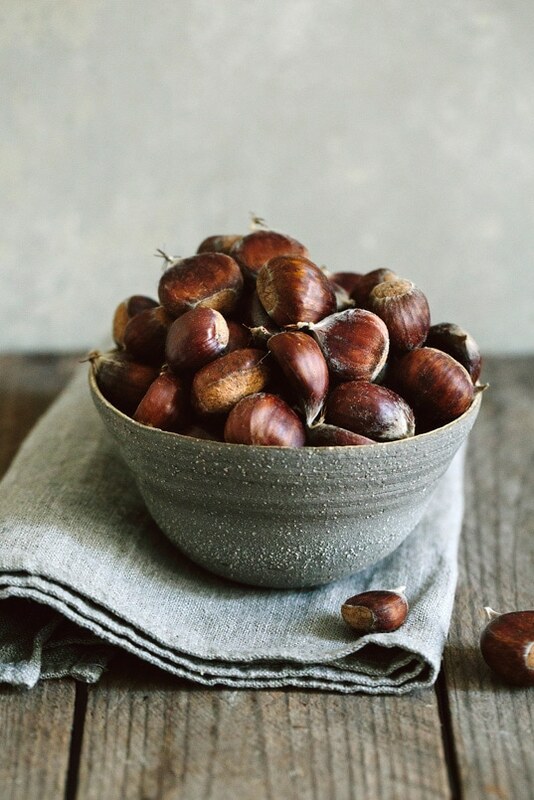 In the meantime, chop the chestnuts and simmer in a small pot with the cream for 5 minutes. Then puree the mixture. 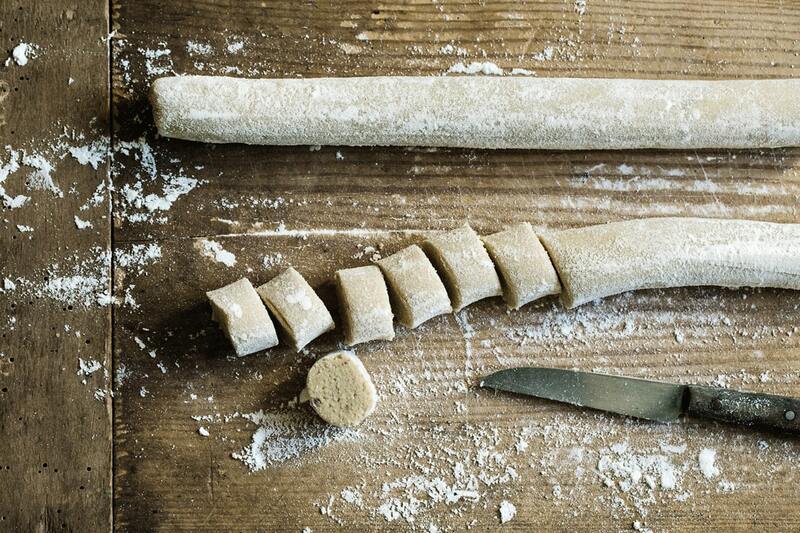 Press the potatoes through a ricer and knead with semolina and the chestnut puree to a smooth dough. Finally season the Gnocchi dough with salt and pepper. 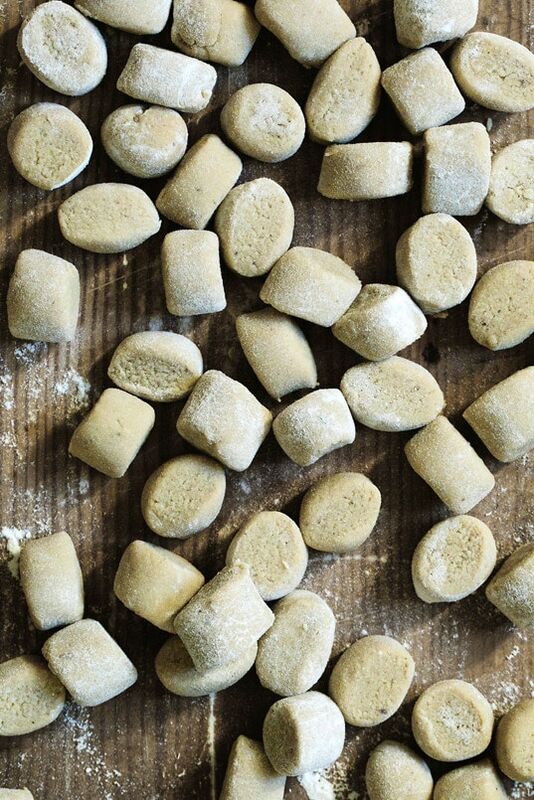 The easiest way to form the Gnocchi is to divide the dough into several balls and form rolls. Cut with a knife and afterwards roll to small balls. 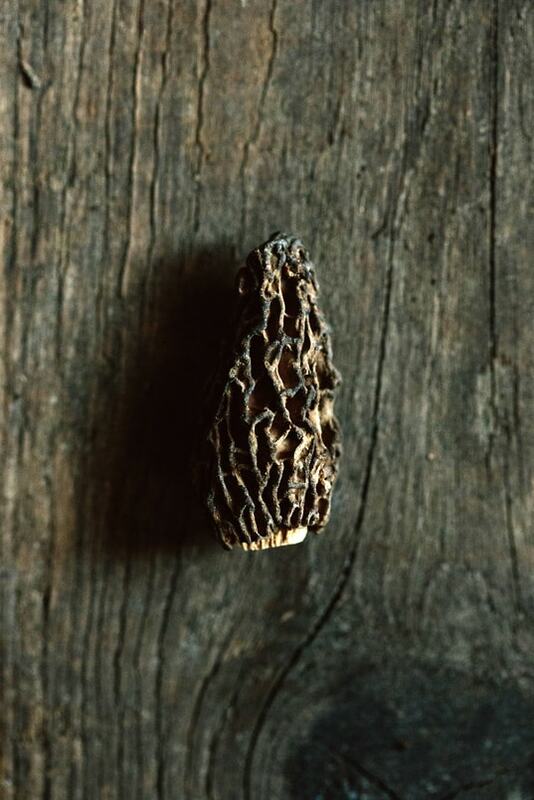 You need to soak the morels in water for an hour before adding to the sauce. Cut the shallot into small dices, fry in butter and deglaze with Vermouth. Then add the morel water, vegetable stock and cream. Let the sauce reduce for 15 minutes, then season with salt and pepper. 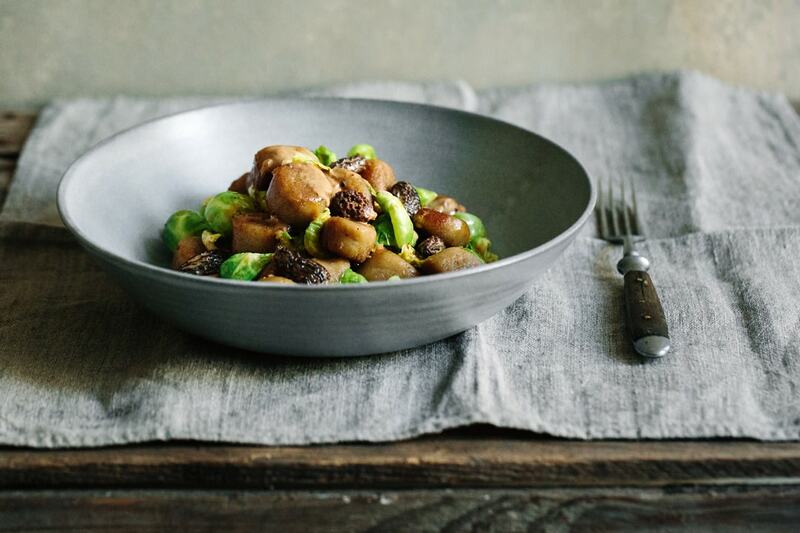 You can now prepare the Brussels sprouts. 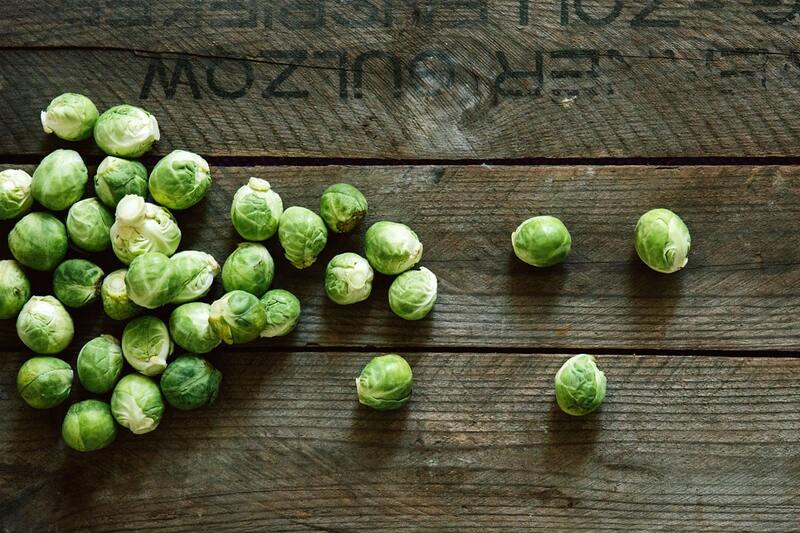 We both are no fan of Brussels sprouts. However, we found out that we like them, if we pluck the leaves and fry them in butter. If this is too time-consuming for you, you can also halve them. In our opinion the leaves have a smoother taste as the whole bulb and therefore it’s worth the work. Put the Gnocchi into simmering water and cook until they swim on the surface. Remove them from the water with a perforated spoon and immediately fry in a nonstick pan with butter. 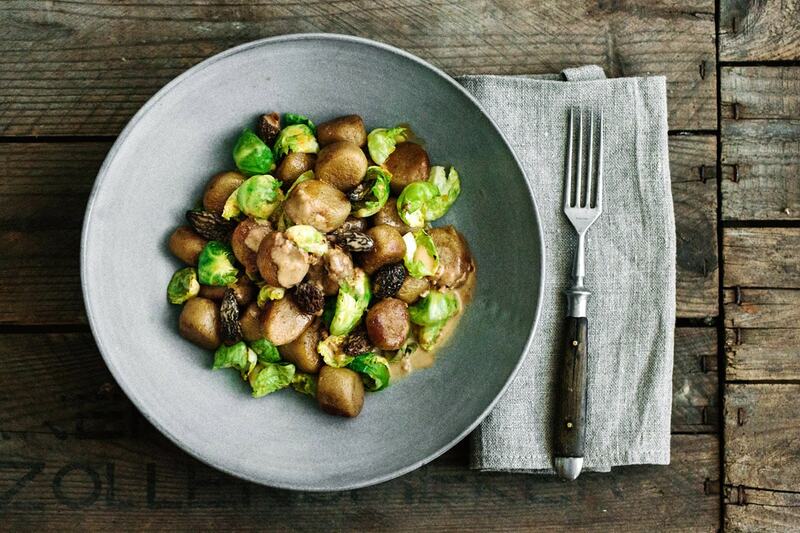 Add the Brussels sprouts and also fry with the Gnocchi. 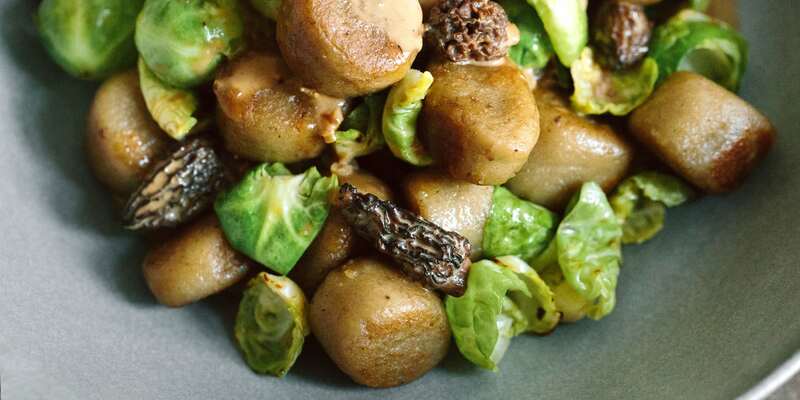 Finally season with salt and pepper, add the morel sauce and mix everything. 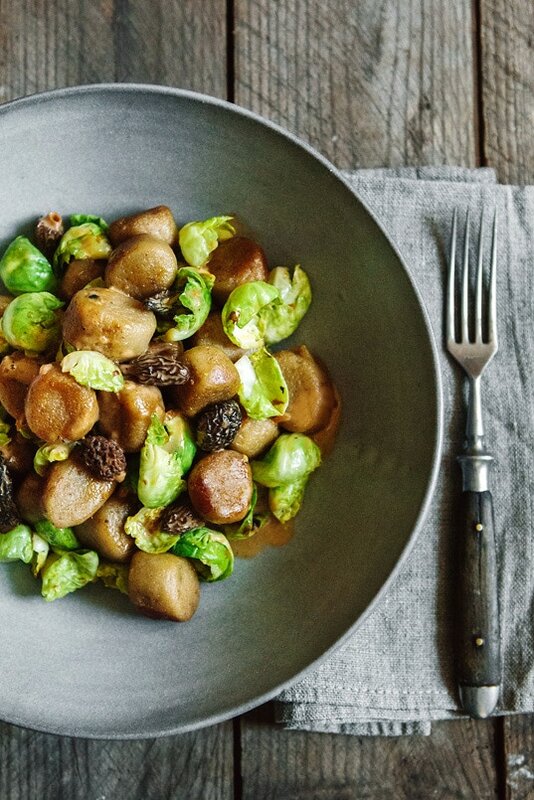 This should be a taste explosion in your mouth because the flavors fit so perfectly together. We are always surprised how yummy this dish is. nachdem dar rote Beete Schoko Kuchen super geklappt hat, hab ich gleich auch dieses Rezept ausprobiert… allerdings mit mäßigerem Erfolg, der Teig war initial nämlich leider jenseits von form- bzw rollbar. Wir haben dann kumulativ sicher je das Doppelte an Mehl und Grieß noch hinzugefügt, ohne Erfolg. Keine Ahnung, was es war. Irgendwann hatte ich die Nase voll und hab mit einem Löffel Nockerln abgestochen, das hat dann auch gut funktioniert und auch geschmeckt, wahrscheinlich nur eben sehr viel mehliger und teigiger und weniger “maronig” als es eigentlich sein soll. Tipps fürs nächste Mal? Andere Kartoffelsorte? Oder gleich zum Löffel greifen, wenn´s nicht geht? An sich ist das Rezept und die Kombi aus Rosenkohl(blättern) und den Maronengnocchi aber super, danke!